In prolonged drought you might leave the collector off the garden tractor and switch to a mulching deck if you have one. The cuttings left on the grass will help to protect the lawn. It’s not too late to scarify if you have a problem with thatch. Clean up the debris afterwards and water well. 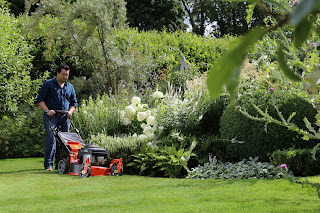 Having talked about the dry weather, rainfall at the end of May and the beginning of the month has, for many areas, meant the mowing has had to be done twice a week, to stay on top of it and keep the lawn tidy. If you haven’t applied weed killer that’s suitable for the lawn this is the last summer month in which to do so, the next period being September/October. If you don’t like the idea of using any concentrated synthetic chemicals you can implement an organic lawn care programme by controlling thatch, using the correct mowing techniques, with a mowing height of 2.5” minimum and making sure the blades are sharp and clean. When you apply organic fertiliser look for product with low ratios of nutrients e.g. 15% Nitrogen – 10% Phosphorous – 15% Potassium.